When your cleaning supplies cause the clutter, how do you condense? Are you overloading your cart with cleaning products? 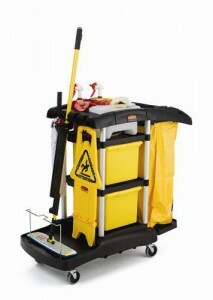 Do you have an organizational method to your cleaning cart? When you’re trying to battle office cleanliness, you may find that you’re adding more clutter to the mix than intended. Take stock of your cleaning cart every once in a while and see what is really necessary and what is providing more clutter than it’s worth. According to the Washington Post, it can be easy when you’re doing spring cleaning to accidentally have the cleaning products add to the clutter. Too often, companies get carried away by having too many cleaning supplies, when there are many multipurpose options that don’t take up as much room. The news provider suggests having multipurpose cleaner on hand that can be used on different surfaces, a brush, cleaning cloths, squeegees, a vacuum cleaner and other rags and sponges, it should be more than enough to keep the office clean and clutter-free. 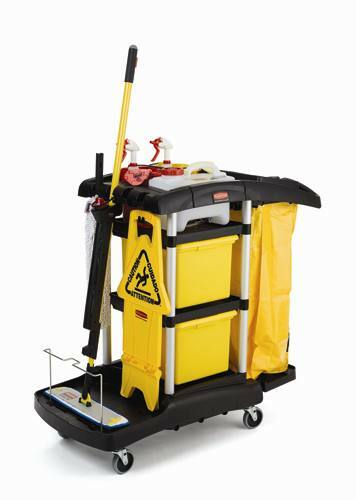 Frequently, having a lot of chemicals could cause fumes to irritate office inhabitants, so there are other benefits for reducing the amount on the cleaning cart. The Huffington Post reports there is also the danger of overusing certain cleaning products. For example, the news provider reports that people will often spray the surface, rather than the cloth itself, which just causes more buildup to be pushed around. This entry was posted in Cleaning and tagged cleaning supplies. Bookmark the permalink.